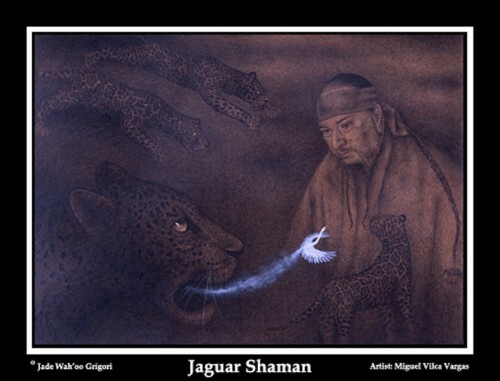 As Jaguar/Black Panther into the Underworld Realm I go, slipping through the twilit land invisibly, silently, with stealth, following the silvery-blue thread of Soul along the pathway which it has traversed since its departure. It is into this Underworld Realm that your Underworld Soul has become lost. While distracting yourself with playful fantasies and imaginings, you have drawn attention. One cannot disturb the field of fluid dream-stuff without it sending a ripple throughout the entire fabric of the Underworld. There are those denizens of the darkness that seek out Lost Souls, in order to capture them, imprison and torment them. The resultant emotional/mental turmoil that arises as a consequence of this disruption, in a person’s 3-D life, generates a massive amount of Life Force (ie, Soul Force). These demons feed upon that Soul Force released by the individual tormented by their own fears, guilt and shame. They sweep out of the shadows, black, sleek and swift. Their claws slash the Demons, dispatching them instantly. The Demons scream their fright, running and trying to flee. There is no escape. To a demon they are each slain by these seeming angels of the Underworld, these Black Panthers. Freedom has responded to your call this Night. At the time of this New Moon I will, at your request, journey forth as a Black Panther, going into the Underworld Realm, there to seek, find and release your Underworld Soul. You will receive from me an email acknowledging your request and payment. Over the course of the three nights I will sojourn on your behalf. You will then receive from me an email with a description of what transpired as I performed your Underworld Soul Retrieval.